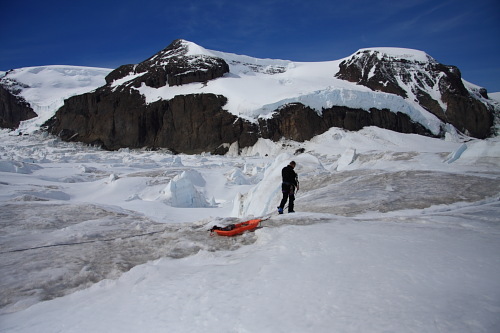 Martin Truffer, of the University of Alaska, tows a radar sled across Rohss Glacier. 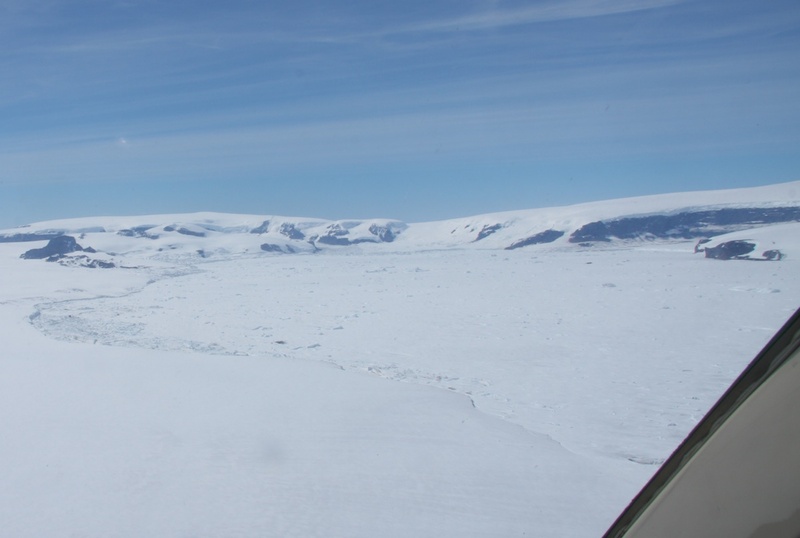 On January 11, two of the glaciology team aboard the N.B.Palmer, Erin Pettit and Martin Truffer of University of Alaska, flew to nearby Röhss Glacier to conduct a radar survey and test the science equipment. 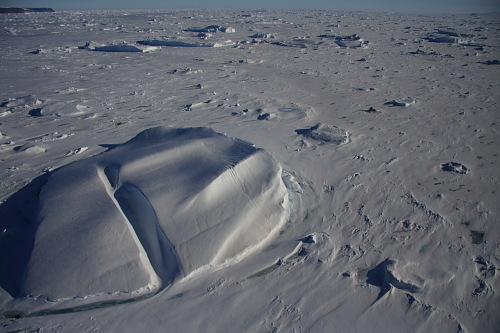 Although not part of the original LARISSA mission, the Röhss Glacier is similar to the glaciers of the Larsen B embayment in that it is rapidly retreating and thinning in the aftermath of ice shelf disintegration, in this case, the disintegration of the Prince Gustav Ice Shelf in January 1995. The Röhss has retreated nearly 25 kilometers (16 miles) in that time. The survey tested the deep radar system that we plan to use on the Larsen B glaciers, which measures ice thickness. We also measured the glacier flow rate at the site using precision GPS systems. 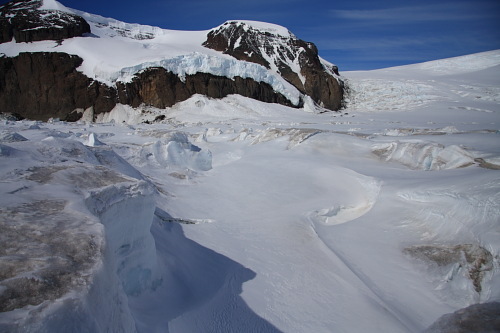 Early results show that the glacier is roughly just 200 meters (700 feet) thick at this point, and flowing at about 200 meters (700 feet) per year. Ted has been studying this glacier’s retreat through satellite imagery, so he was pretty happy to have Martin and I get some ground data to supplement his satellite work. It was, of course, a glorious flight over with Chris. We stopped on a bedrock knob next to the glacier to set up a quick GPS base station. It’s all volcanic rock over there, with lots of crumbly pumice. Ted had given us approximate coordinates based on his satellite images for landing on the glacier. The entire lower part of the glacier is broken up with crevasses due to its fast retreat, so the point Ted gave us was in the middle of a crevasse field. But as it was the most interesting part of the glacier for the data we wanted, we chose a broad, flat icy area between two large rifts. The flat area was probably 200 or 300 meters (700 to 1000 feet) long and 30 meters (100 feet) wide. It was snow-free, with dirty ice showing through, so we new it was safe to land and work. 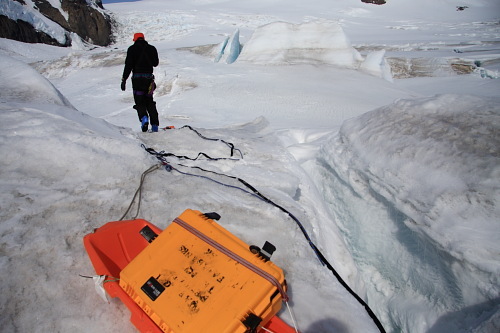 We put a GPS on the glacier to measure its motion. Martin’s processing of those data this morning show that it’s moving about 60 centimeters (24 inches) per day. We also strung out our radar system (two 20-meter antennas, which spread out quite a ways on our little ice ledge). We profiled as much terrain with the radar system as we could safely between crevasses, about 200 meters. We had fun navigating around snow patches, which can hide crevasses. We also jumped over a few tiny crevasses in the ice, where we could see what was solid and what was not. The ice surface of the Röhss is rugged and dirty with grit from the surrounding peaks, and most of last year’s snow has melted away. Martin Truffer tows a radar sled between crevasses on the Röhss Glacier. The N.B. Palmer sits in the midsts of fast ice in the Prince Gustav Channel. 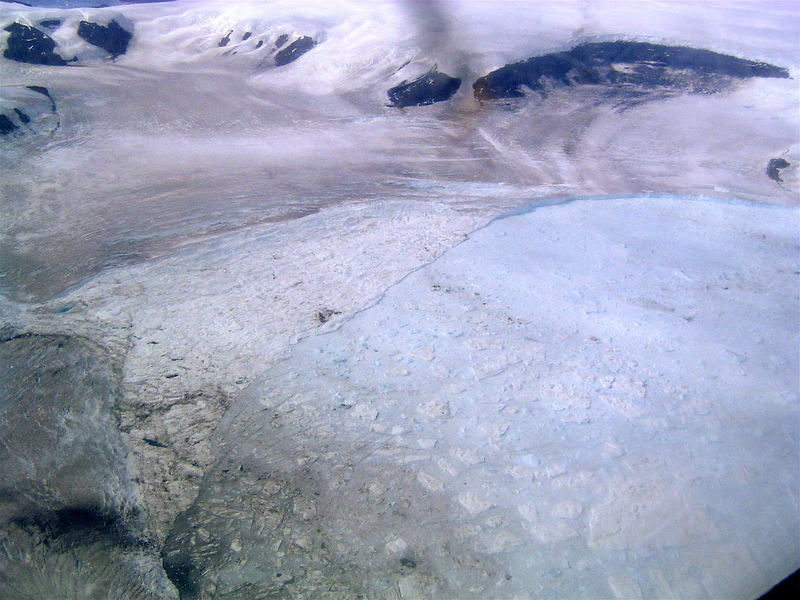 This image, taken by Martin Truffer on Monday, shows how much Röhss Glacier since Ted’s similar picture in 2006. Prince Gustav Channel is filled with a mixture of icebergs and landfast ice from last winter. 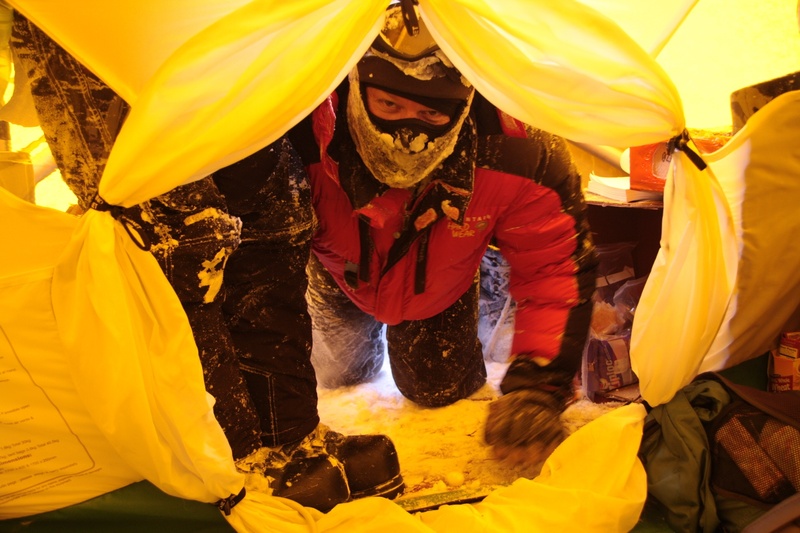 Martin Truffer, of the University of Alaska Fairbanks, tows a radar sled across Rohss Glacier. We have arrived at Rothera Station! Erin, Ted and I had a great flight south from Punta Arenas, Chile to Rothera Station, arriving Sunday afternoon. The team jumped right in to organizing our equipment for the flight to the survey site. Monday brought more cargo work and a shakedown cruise of the radar systems. It was a long day, but everyone had a great time.